1. 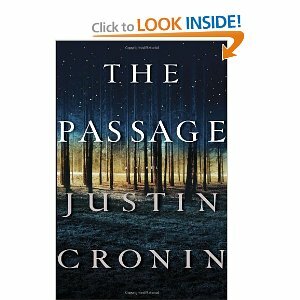 The Passage by Justin Cronin: This is the book that I found the hardest to put down this year, and by chance it’s also the biggest. This is an extremely well written, expansively constructed book about a virus that pretty much ends the world. 2. City of Thieves by David Benioff: Who knew that you could write a buddy comedy set during the Siege of Leningrad? Benioff does the opposite of what Cronin did–he wrote a slim, sparse, focused novel about two Russians on a mission to find a key object. 3. The Sparrow by Mary Doria Russell: What would it mean for religion if we discovered that aliens were real and reachable? Russell explores this topic in this magnum opus. 4. Rework by Jason Fried: It took an amazing book by the 37signals founder to trump Dan Ariely’s Predictably Irrational, and this is that book. This is the business book that I want to pass around to everyone I know. 5. Oryx and Crake by Margaret Atwood: This may be the best constructed book I’ve read in a long time. You know the ending as soon as the book begins, but it opens up so many questions about how it happens that you have to keep reading. Atwood reveals the answers at the perfect times. 2011 portends be a big year in books, with both Patrick Rothfuss and David Anthony Durham coming out with new novels. I can’t wait! What were your favorite books of 2010? This entry was posted on Tuesday, December 28th, 2010 at 11:01 pm	and is filed under books, favorites, list and tagged with favorites. You can follow any responses to this entry through the RSS 2.0 feed. I was admittedly late to the Hunger Games game (see what I did there? ), but I really liked Mockingjay, almost as much as I liked the rest of the trilogy. What disappointed you? I loved The Hunger Games, enjoyed Catching Fire, and was bored and disappointed by Mockingjay. The key for me was that Collins structured the book so that people were always waiting for something to happen. On one hand, that’s fairly realistic. A lot of wars are fought by waiting. Waiting for the enemy to come to you. Waiting for insurgents to strike so you have something to respond to. Waiting for someone to throw the first punch. The trouble is, even if Collins was trying to be realistic, it makes for a really boring novel. She did very little to propel me forward from chapter to chapter. I think the only chapter that left me hungry to keep reading was the one where (spoilers) Katniss gets shot. But even then, within a few paragraphs you find out that she’s fine. Most of the book is spent waiting for something to happen (more spoilers). Katniss waiting for the revolution to happen. District 13 waiting in the bunker to be bombed. Katniss waiting for Peeta to not be crazy anymore. Katniss waiting for her ribs to heal. Katniss and crew waiting for the black wave to solidify. Katniss and crew waiting in the secret room in the fashion boutique. For days! Katniss waiting to heal after catching on fire. Even in the epilogue, Katniss waiting to marry Peeta. To make matters worse, in many places where there should be action, there is nothing. The entire revolution (besides District 2 and the Capitol) happens in a few sentences. The destruction of the mountain in District 2 happens in a single paragraph. The rescue of Peeta and friends isn’t even described at all. Katniss gets into the action in District 8, and kind of in the Capitol, but she’s still isn’t given much to do there. Multiple times she gets injured, and then we cut to the next chapter when she’s healing. This should have been a book that I read from cover to cover in one sitting. Instead, I found it all too easy to put down. I feel like Collins forgot how to write an entertaining story, a story that propels the reader forward. Or maybe her editor is at fault, I don’t know. All I know is that The Hunger Games draws you in, leaves you on the edge of your seat (even when Katniss is waiting in that book, the stakes are so high and the danger is so close that you can’t wait to know what happens next). Mockingjay failed in those regards. I was also disappointed with Mockingjay. The Hunger Games and Catching Fire captivated me; I expected more from Mockingjay and it just didn’t deliver. Interestingly, I also checked out Day for Night at the library, after loving The Lost Legends of New Jersey. I didn’t even finish it! Granted, several of the books I had on hold came in at once and I only had so much time, but it just didn’t hold my attention. I haven’t read one book on your Top Five list! I’ll have to make a point to add some to be TBR pile. I’ve heard of #1, #4 and #5 before–those will likely be the ones that I tackle first! Thanks for posting these suggestions. Ha ha…I’m with you on Day for Night. I only finished it because it was a book club book, but it was a huge disappointment after the intricate and moving characters study that is The Lost Legends of New Jersey.